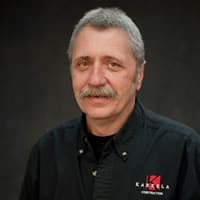 Mark Arnold, Superintendent, Karkela Construction | Karkela Construction, Inc.
Mark joined the Karkela team in 1986. His experience in the construction industry is extensive and has spanned over 44 years. Customer satisfaction is Mark’s key value in working with clients. Prior to joining Karkela, he began his career as a laborer for the bricklayers union. Mark eventually joined his brother’s (Pat Arnold) business in constructing new homes and commercial projects. Mark’s many successful projects include multiple Valvoline Oil Change centers and hundreds of dental/healthcare clinics. His experience ranges from ground-up projects and expansions to extensive interior remodeling projects. With Mark’s experience, knowledge and understanding of the construction field, he will make the customer’s transition easy into their newly constructed or remodeled facility. "Karkela was professional, responsive, and did a great job managing our project. The office finished out beautifully. We constantly get compliments on our space. Thanks Karkela!" Kellee N. Kattleman Stanton, D.D.S.